||||| SECURITY ISSUES are always concerning. We are so secure that some computers may try to block the ordering process. Our Cart ENCRYPTS your secure information when submitted on our cart.. We also use Geo-Trust SSL (128 bit) making it the safest transaction available. (For more information, see NEWS (left column) -or call 877 695 3561. ||||| 24 PRINTABLE PARTS CATALOGS: All items in the SUPPLIES section of the Rosary Workshop are in a printable catalog for your convenience (no paper catalog available). Return to RosaryWorkshop.com (link at bottom of this page) to access this feature. Always check for current date in upper left hand corner so you will have all items available. ||||| UNABLE TO FILL ORDERS UNDER $25: Most companys require a minimum of $50 - $100 per order for these two reason: 1. HIGH SHIPPING: (Shipping can run higher than the item itself.) 2. BANK FEES ON CHARGES: We cannot change this but will honor any small orders by mail (USPS). 6 + ROSARY MAKING TOOLS for strung rosaries, we have all you need for stringing rosaries. Side cutters, pliers, 3 colors crimps, crimping pliers, 3 colors .019 softflex wire. 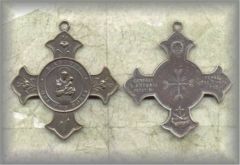 4 + ROSARY CENTERS from Antique Medals - we added the rings so these medals could be used with Antique crucifixes on rosaries. 11 + RELIGIOUS MEDALS, symbols of a rich heritage. Telling of special devotions and saints who interecede for us today. 69 + ANTIQUE AND NEW BEADS - Loose beads in antique, vintage, contemorary, glass, wood. When available, we will share but remember most are limited and unreplaceable. 79 + EUROPEAN ROSARY CENTERS - This series is a collection of our more recently acquired rosary centers. In some cases we have taken old medals and set 3 rings on them for center use. 13 + EUROPEAN CENTERS - Centers for rosaries and chaplets. First of our series and remains popular. Traditional rosary makers will find a wide selection of items to use in their work. 11 + LATIN AMERICA (New Spain) Centers in this group are developed from medals dating from the 18th and 19th centuries. They carry the quality of the handmade. 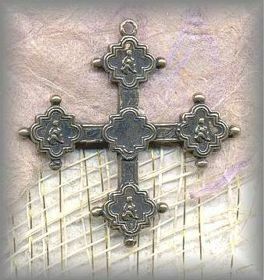 24 + EUROPEAN CROSSES - A remarkable collection of antique and vintage crosses, treasures from the past, given new life for use today. 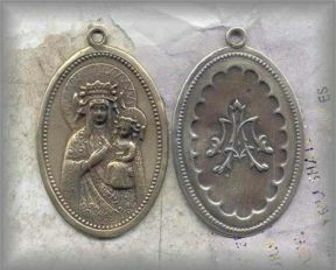 Use on rosaries/jewelry to show sign of your birth. 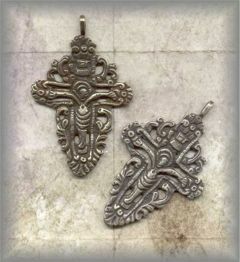 22 + SAMSARA COLLECTION - A beautiful collection of crosses by Samsara. 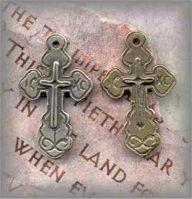 Crosses for use in rosaries, chaplets and jewelry. Be sure and see the wearables as they are rare and beautiful. 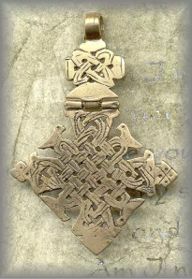 16 + ETHIOPIAN CROSSES - Beautiful old Ethiopian crosses and medallions dating to the 19c and before. 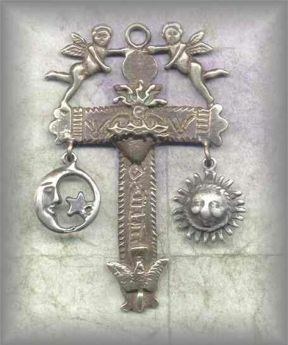 More from Ashes to Beauty, Charms, hearts, crosses. 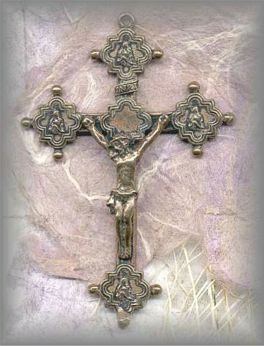 64 + EUROPEAN CRUCIFIXES - This remarkable collection of recast crucifixes are our most recent. We are very excited about these beautiful pieces from the past. 14 + SAMSARA COLLECTION - Very popular. Very rare. Items from Samsara are some of our most popular ever. Bes sure to see all of his items, Hidden surprizes! 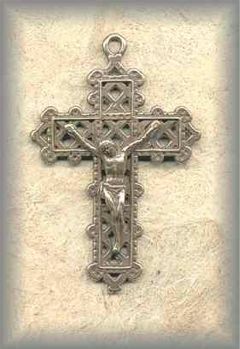 15 + EUROPEAN CRUCIFIXES - Our first collection up and especially popular with those making traditional rosaries. Mostly from the early 20th, late 19th century. 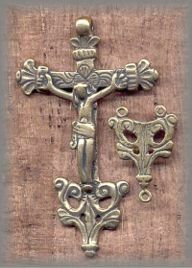 20 + LATIN AMERICAN CRUCIFIXES / CROSSES - Inspired by early Spanish pieces brought to New Spain by early Explorers and evangelizing Friars. Originals handmade by local artisans. 17 + EUCHARISTIC MEDALS - A fine collection of Eucharistic Medals from Europe. Add to rosaries, chaplets, jewelry for 1st Communion or Confirmation or any special event. Not to be missed! 14 + FEMALE SAINTS MEDALS - A growing collection of your favorite saints. Add to your designs / devotions. 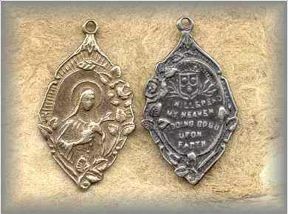 (See Communion of Saints Chaplets). We learn how to say YES to the Lord. 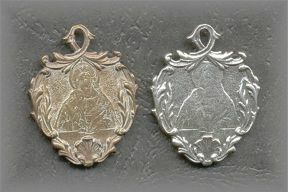 6 + ANGEL MEDALS - Be sure and see the growing collection of Angel medals, St Michael and St Rafael. 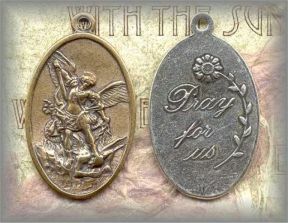 Also note that Guardian Angels are often found on the reverse side of our other medals. 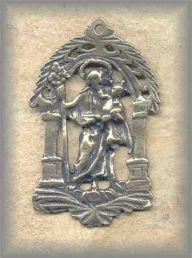 24 + MALE SAINTS MEDALS - Look for your favorites, Sts Francis and Anthony (Franciscan favorites) with a wonderful collection of very interesting St Benedictine medals - powerful against evil. 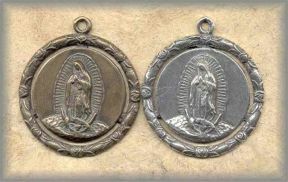 2 + OUR LADY OF GUADALUPE MEDALS - A rare and beautiful collection for those who favor the devotion to her. Patroness of the Americas and Patroness of the Pre Born. 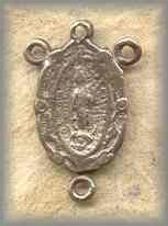 16 + LATIN AMERICAN MEDALS - metals from 19c or before that have been hand made and inspired by the apparitions in 1531 to Juan Diego. 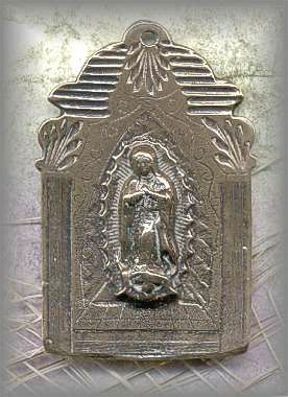 72 + SAMSARA MEDALS - Look here for more medals of Our Lady of Guadalpe & other Latin American themes and pieces. Be sure and look at whole collection. 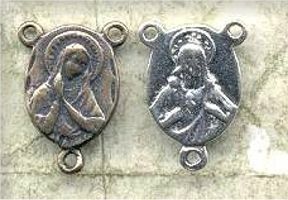 12 + ROSARY SETS - Include a center and a crucifix, cast from antique and vintage rosary sets that were made tobe used together. Many are only available here. 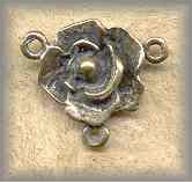 16 + FINDINGS: Bronze and sterling rings, clasps, toggles - cast from antiques. 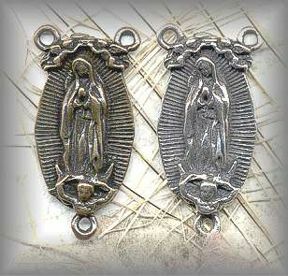 Perfect for use in jewelry and chaplets - with our other pieces as retain thier hand made look.